One of the reasons why we believe dark matter exists is that it is necessary to understand how galaxies came to be starting from the primordial conditions in the Early Universe. The 'oldest' light in the Universe we can observe is called the cosmic microwave background (CMB). It comes from a time when the Universe was approximately 380,000 years old, quite an early epoch compared to the age of the Universe today, nearly 14 billion years. From the CMB we can infer that at the time the Universe was very homogeneous, containing regions with only small differences in temperature and density. With time, the regions with the highest density pulled gravitationally the matter around it and grew ever larger in time. We need the additional gravitational pull of a substantial amount of dark matter to explain how the primordial tiny density fluctuations in the CMB grew large enough into very dense galactic systems. The dark matter fluctuations end up evolving into extended dark matter structures called dark matter haloes, which are supported against gravitational collapse by the large velocity dispersion of the dark matter it contains. Galaxies form within these haloes from the condensation of gas into the centre given rise to the formation of stars. A galaxy like our own, the Milky Way, is surrounded by a dark matter halo that extends ten times beyond the size of the visible galaxy. The figure shows the result of a numerical simulation that models (starting from the conditions in the CMB) the growth of a halo like the one around our own galaxy (credit, Springel et al. 2008). The halo is comprised of a smooth distribution of dark matter and a plethora of smaller dark matter clumps (called subhaloes). The Milky Way galaxy would live in the centre of the halo, while the Milky Way satellites would live within the different subhaloes. 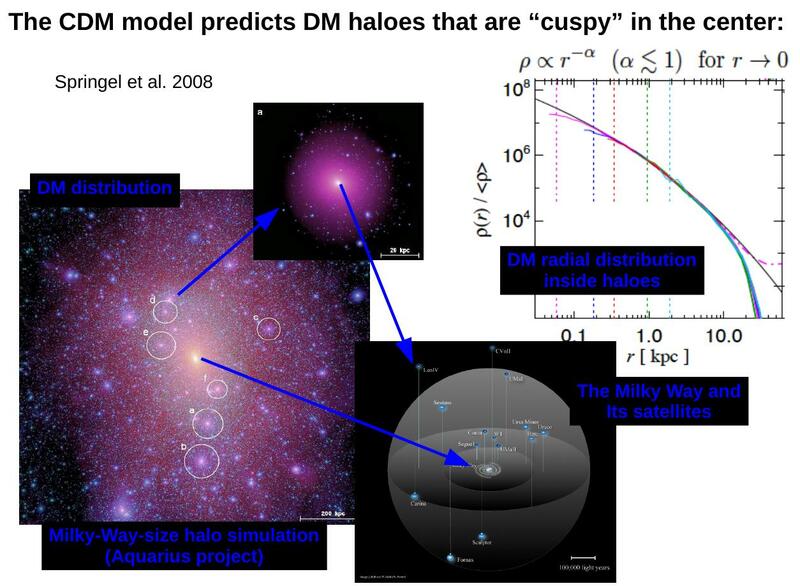 The CDM model makes two key predictions for the galaxy population: a large abundance of subhaloes and large dark matter densities towards the centre of haloes/subhaloes. The latter is not the case in SIDM as I will discuss in the next post.